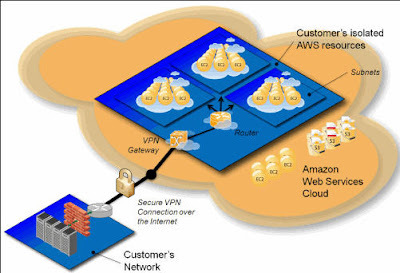 Yesterday, Amazon introduced Amazon VPC. It enables logically isolated compute instances and a VPN tunnel to connect to internal data center resources. The architecture is straight forward and Amazon’s blog post depicts is as follows. But the implications of VPC are far reaching; there are no real hurdles left to leverage Amazon’s cloud except for limited and costly Internet bandwidth. Amazon’s offering is morphing into a very flexible IaaS with some content delivery network features that are great for geographically dispersed small businesses. I am thinking particularly companies such as Stillwater that are differentiating through high domain expertise. Global talent cannot be bound to a small locale such as Silicon Valley anymore. We are connecting researchers in US, EU, Middle East, and Asia and with offerings like this we can create a development process that follows the moon that rivals the mega-vendor infrastructures. We do not need to uproot any folks to make this happen. These are exciting times we live in that can really unleash the creative spirit of the world.